Twin-lever mechanism cuts stapling effort by 30%! Staples clinch flat so paper stacks neatly. Metal and high-impact plastic. Non-skid rubber base. 3 throat depth. Top loads a full strip (210) of standard staples. 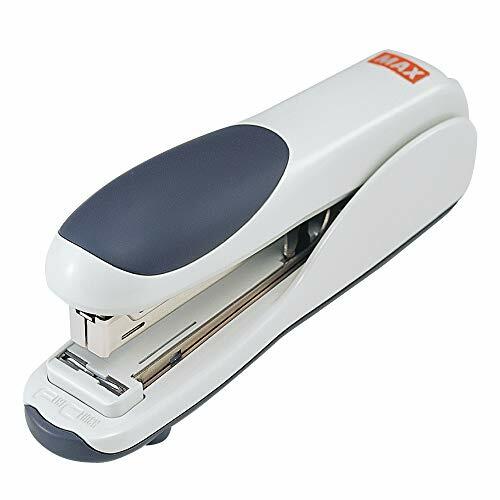 Stapler Type: Full Strip Desktop; Global Product Type: Staplers-Full Strip Desktop; Staple Capacity: Full Strip (210 Staples); Size of Staple Used: N/A. Innovative twin-lever mechanism cuts stapling effort by 30%! Staples up to 30 sheets. Staples clinch flat so papers stack neatly. Metal and high-impact plastic construction. Easy-grip top, non-skid rubber base. 3" throat depth. Top loads a full strip (210) of standard staples. Manufacturer's one-year warranty. All sheet capacities are based on 20-lb. bond. Twin-lever mechanism cuts stapling effort by 30%! Staples clinch flat so paper stacks neatly. Metal and high-impact plastic. Non-skid rubber base. 3" throat depth. Top loads a full strip (210) of standard staples. Stapler Type: Full Strip, Flat Clinch; Staple Capacity: Full Strip (210 Staples); Type of Staple Used: Standard; Sheet Capacity: 30. 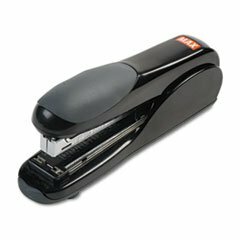 Max Products - Max - Flat-Clinch Standard Stapler, 30 Sheet Capacity, Black - Sold As 1 Each - Innovative twin-lever mechanism cuts stapling effort by 30%! - Staples clinch flat so papers stack neatly. - Metal and high-impact plastic construction. - Easy-grip top, non-skid rubber base. - 3" throat depth. Max - Flat-Clinch Standard Stapler, 30 Sheet Capacity, Black - Sold As 1 EachTwin-lever mechanism cuts stapling effort by 30%! Staples clinch flat so paper stacks neatly. Metal and high-impact plastic. Non-skid rubber base. 3" throat depth. Top loads a full strip (210) of standard staples. Stapler Type: Full Strip Desktop; Staple Capacity: Full Strip (210 Staples); Size of Staple Used: N/A; Type of Staple Used: Standard.Innovative twin-lever mechanism cuts stapling effort by 30%!Staples clinch flat so papers stack neatly.Metal and high-impact plastic construction.Easy-grip top, non-skid rubber base.3" throat depth.Includes one stapler. 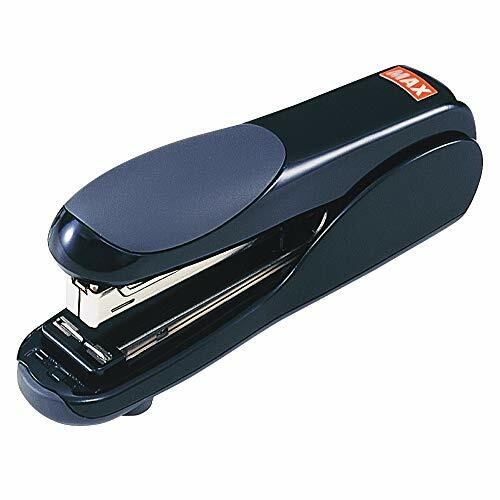 Max - Flat-Clinch Standard Stapler 30-Sheet Capacity Black "Product Category: Staplers & Punches/Staplers"
Flat-Clinch Standard Stapler 30-Sheet Capacity Black - Twin-lever mechanism cuts stapling effort by 30%! Staples clinch flat so paper stacks neatly. - Metal and high-impact plastic. - Non-skid rubber base. - 3" throat depth. - Top loads a full strip (210) of standard staples. 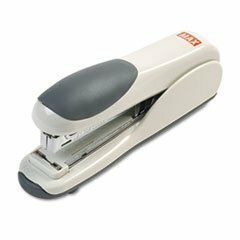 - Stapler Type: Full Strip Desktop Staple Capacity: Full Strip (210 Staples) Type of Staple Used: Standard Sheet Capacity: 30. Want more Standard Flat Clinch 30 Sheet similar ideas? Try to explore these searches: El Camino Bed Floor, Smc Stand, and Clear Thermal Lens.